Watching Olbermann Watch: Blogger Covering Libby Trial Asks "How should bloggers cover the Libby trial?" 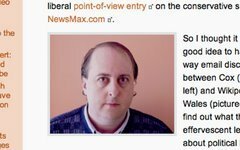 Blogger Covering Libby Trial Asks "How should bloggers cover the Libby trial?" So, what do I have to offer as a blogger, that isn’t already being offered by other bloggers and by the members of the traditional media? What is my hook, my spin, my unique perspective? Ummm. Shouldn't you have thought about that before you signed up to cover the Libby trial? My initial thought is that my interest won’t be the standard legal type stuff that you can get everywhere else. I’m not a lawyer. The closest I’ve ever gotten to a trial has probably been watching Perry Mason as a kid, or waiting in the jury selection room, hoping I wouldn’t get called. You're there to cover a trial. Why would you not be interested in "the standard legal type stuff?" If you've never been to a trial, why are you there in the first place? Are you close friends with Bob Cox? Do you swallow his particular brand of right-wing insanity? What is the impalpable essence of the courtroom atmosphere as it relates to our national story that can’t easily be summed up as “Today, Judith Miller testified that...” It has to do with our common story and perhaps a little bit with group dynamics. So, in other words, your coverage isn't going to include facts that the mainstream media might miss. It's going to include subjective interpretation and using that penetrating analysis of yours to discover the "group dynamics" of the courtroom? These are the pioneers by which all subsequent blogger coverage of landmark trials is to be judged? If you're the best and the brightest of the blogosphere, I'll take the mainstream media any day.